If you want to have a luxury experience every time you step into your car, buying a pre-owned luxury vehicle is the smartest, most economically-savvy decision you can make. You get a fantastic range of features and performance capabilities, while at the same time paying a much more reasonable price point than you would for a new luxury vehicle. However, finding your ideal pre-owned luxury car is not always easy. Luckily, Certified Autoplex is here to help by highlighting the available vehicles we have. Here, we will be giving details on the Audi A8 L sports sedan. Audi is the reason that people associate German engineering with incredible performance and reliability, and the A8 L is equally indicative of those qualities. Let's take a closer look at some of the great features that make up the Audi A8 L. If you are in the Dallas TX area and want a used Audi A8 L, follow this link to our inventory. We currently have four available models of the Audi A8 L, which are from the 2017, 2016, 2015 and 2014 model years. While the most notable feature of this vehicle is its powerful performance capabilities, it undoubtedly has numerous other fantastic features to offer drivers. In terms of performance, there is more than enough power and handling to go around. The 3.0L V6 engine in the Audi A8 L generates up to 333 horsepower and 325 lb-ft of torque, which give this vehicle a ton of get-up-and-go. Additionally, it has top-of-the-line handling features like an 8-speed automatic transmission, electronic stability system, independent multi-link suspension and much more. In terms of safety features, the Audi A8 L has what it takes to give you and your passengers peace of mind out on the road. Mechanical safety features include knee protection airbags, power height-adjustable seatbelts, traction control and more. Technological safety features include lane-departure warning, blind spot monitoring low tire-pressure warning and more. Finally, this vehicle absolutely does not disappoint when it comes to luxury features. Some of these great features for comfort and convenience include things like a 14-speaker audio system w/a premium amplifier, heated seats, adaptive cruise control, dual-zone automatic temperature control, remote keyless entry and much more. 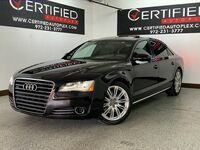 Interested in an Audi A8 L?